I returned to my first world, dismayed to find it dying. Everything I built remained; the high tower, the markers, the secret place. Winter claimed the rest. Rolling green hills shrouded in snow. Warm, sandy beaches became mud traps. Withered trees shuddered in violent winds, shriveled branches reaching for the sky with no leaves to renew them. I left my secret den, carved from the first mountain, and followed the markers to the tower. The fires blew out long ago. The wind ravaged the upper floors. It howls through the shattered stone, angry, threatening. The tower once occupied an island. I built it here because I fell in love with the blue of the water and the soft lapping as it caressed the shore. In the evenings, I used to stand on the balcony of the tower’s grand glass ballroom, watching the sun kiss the ocean, setting it ablaze. That ocean is frozen now. The ice creaked beneath my feet, though it is thick, too thick to break. Did I spend too much time traveling? Did the world grow unstable in my absence? I have traveled many worlds, but none quite like this, my first. 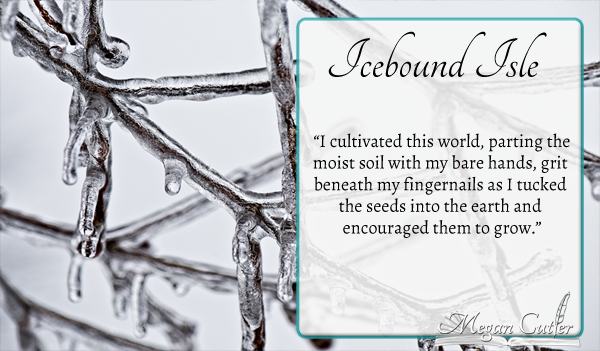 I cultivated this world, parting the moist soil with my bare hands, grit beneath my fingernails as I tucked the seeds into the earth and encouraged them to grow. I carved channels through the rock, tunneling to the deep places where fire flows close to this world’s heart. I sculpted the tower from stone. I climbed mountain spires above the clouds, descended deep ocean ravines, bathed beneath waterfalls, and set the markers to lead me back. There are wonders in other worlds. On the floating islands of Anathur, there is a monastery with walls of stained glass mosaics. Sun shining through the tinted glass produces shades of color not yet named. I spent three months with the monks, meditating in their gardens of color, but I understood none of their abstract riddles. Two years I spent in the jungles of Rynim learning to hunt the singing beetle. The trees there are so tall, you cannot see their leaves from the ground. Scaling the red-bark trunks to the canopy city, the ground becomes a distant memory. The inhabitants see it rarely; they extract their drinking water from the clouds. I solved the riddle of the Sonimos maze. The telepathic gardeners who maintain it spend their entire lives shaping stem, thorn and blossom so that, by the time you reach the center, the path to the exit has changed. I even beheld the fire caverns of Tay that can only be viewed from a life-support enclosure. The flames form stalactites and mites as they reach for each other across vast chasms. The stones beneath glow red and white and sometimes blue. Their light is soothing and hypnotic as the enclosure sways in the heat induced thermals. But of all the universe’s gems, I loved this world most. I ascended the spiral staircase to the tower’s ruined top floor. The ice is a silver-blue blur far below. The smell of decay accompanied me. Even so high off the ground it sticks in my nostrils or, perhaps, the memory evokes this reaction. Could I save it if I stayed? Breathe warmth back into the world’s heart, turn the snow back to rain, coax the flowers from their wintery dens, set the rivers back to flowing and break the ice that binds my isle? There will never be another world like this one. The twin horned mountain. The underground birch forest. The obsidian desert. I conjured them with abandon as I pulled this world from the mists. High mountains, sheer cliffs, deserts bordering marshlands, wheat fields in granite pits. There was beauty in that chaos. Did my childish whimsy doom this world? The other worlds must also be considered. Will they decay without my touch? Every moment I delay, the risk grows. Anathur might tumble from the sky. The flames of Tay could cool. Yet my heart sobs to abandon my first creation. Could I ever travel fast enough to maintain them all? Fear overrides sorrow, an icy lance piercing my chest. Did I dream too vividly? Will my greed undo my passions? My toes hang over the edge of the ruined rock wall. The air grows suddenly still as if the world holds its breath, waiting for my answer. Must I choose only one? Fighting a sense of vertigo, I peer downward. The island is gone, the thick ice split by a growing black scar. The rift opens like the jaw of an ancient creature, yawning, starving. The mist drifts from the dark emptiness, reclaiming my prized creations as it spreads. It flows beneath all worlds like a universal river, lifeblood of all that lives. Surely if I give myself to the mists, enough of my essence will reach those places I dreamed to life to renew their heartbeats and strengthen their vitality. There isn’t time to think about what I’ll sacrifice. It’s worthwhile if it safeguards my darlings. I spread my arms, welcoming the fate to come. It takes such a small movement to tip me off balance. The air screeches past my ears as I plunge toward the waiting chasm below. Into the darkness. Into oblivion. Into death. And life. Changes – What’s Coming Up This Year?